A long time ago, in the courts of Heaven, a Divine drama began to unfold. The Father looked at His Son. The perfect reflection of His glory, the radiance of His nature, and the delight of His Soul looked back at His Father with longing in His heart. 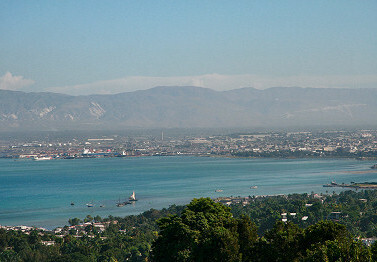 The Father said, “Jesus, if you just ask Me, I will give You the nations of the earth as Your inheritance, the ends of the earth as Your possession.” (Psalm 2:8, paraphrased) As The Father asked this question, I assure you, Haiti was on Jesus’ mind. When I was 16 years old, I sat in my church’s worship service in Nacogdoches, TX. The Hillsong Australia song “You Said” was played. “Ask and I’ll give the nations to You / O Lord, that’s the cry of my heart / Distant shores and the islands will see Your light / As it rises on us”. 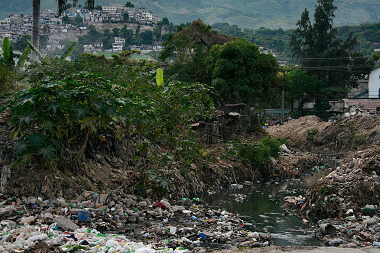 That morning, I began to weep in prayer over the nation of Haiti. I felt Jesus’ very heart for this people walking in great darkness (Isaiah 9:2). 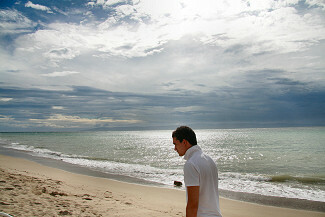 I began to cry out to the Lord, “Distant shores and THAT island will see Your light”. Our day began early, Wednesday, December 5th, meeting at 4:15 am. At the airport, miraculously, they did not weigh any of our bags! We had budgeted over $200 for overweight bags to get hundreds of pairs of shoes to the pastors and orphans. I was amazed at God’s faithfulness! Fourteen hours later, we landed in Haiti about 8:30 pm. Even with little electricity, the night life was active. Many crowded through the streets with candles and goods. Looking out our van window, I began longing for a Nightwatch in Haiti like there is in Kansas City to declare, “The Night Belongs to the Lord”. After about an hour’s drive we arrived at OMS, the missionary hotel we stayed at. The next morning I awoke to several unfamiliar sounds: roosters crowing and early rising Haitians outside our walls preparing for a long day of work. We had a brief time of prayer and started our walk to the church. The streets were lined with merchants offering anything from fish to fresh mangos, pineapple and sugar cane to American toothpaste. 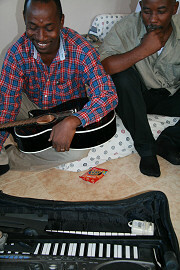 When we arrived at the church, we prayed over the seats and Joy, Victor, and I began setting up for worship. The sound system was quite antiquated and the drum set was missing a few things. And, well–thank God I brought my own keyboard! I looked around and asked James, “Where are the mic stands?” They didn’t have any! So, we improvised. We had living mic stands! Back in America, I had concerns that they would not understand what I was singing since we only had five months to learn our songs. However, I sang the song “Chan de Viktwa” (“Victory Chant”) and a certain relief set in when I heard them actually singing with me. At the end of the worship time, James asked me to lead a song I wrote that we translated about the Father’s Heart, “Papa, Kenbe Mwen” (“Father, Hold Me”). It dropped like a lead balloon. Everyone just stared at me. I prayed. I knew that we were facing a deep cultural barrier. The Father’s heart is difficult to express to a culture where most kids are abandoned by their fathers at a young age left to be raised by their mothers or, worse, completely forsaken as orphans. The second morning Joy and I led worship again. This time, towards the end, I led my two songs about the Father, “Bra Lanmou’w” (“In Your Arms of Love”) and my song “Papa Kenbe Mwen” (“Father, Hold Me”). Before I started, James addressed the pastors and leaders in Creole. I’m not sure what all he said, but it worked! As I sang, I could tell that Father was breaking through the cultural barriers and touching their hearts deeply. 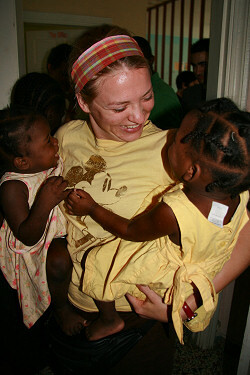 I began singing some phrases spontaneously in my broken Creole, “Father loves you” and “Father, I love you”. 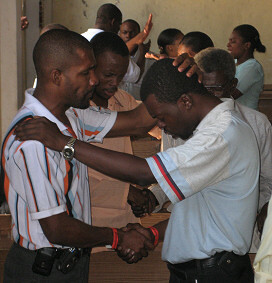 We probably can not even imagine how much these worn-down pastors needed this embrace from our Father. Later, I shared with the pastors from Psalm 2 telling them my desire to go to Haiti when I was sixteen but not being able to go. Then, I had not planned to share this, but I said, “For the past month, our whole house of prayer has been praying for you. 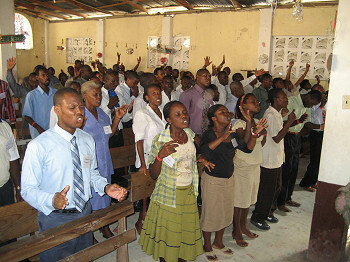 The leadership at our house of prayer has had a particular burden for Haiti. You are not alone. You are not alone. You are not alone.” 2. As I said this I could feel the Holy Spirit breaking isolationism off of their hearts. One of the most incredible moments was seeing pastors from all denominations holding hands crying out for their nation. The last day was an amazing cap on the conference. 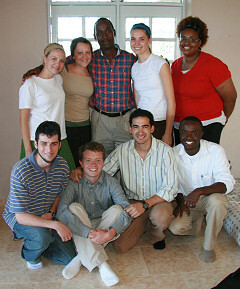 Our trip leader, who is native Haitian, James Adams, began identifying with how difficult it is to be a pastor in Haiti. He started weeping. Across the room, pastors from all denominations began holding hands in prayer crying out for their nation. I was out in the pews sitting with them. I can not quite describe how I felt, except, that I felt like a Haitian, too, crying out for my nation. I will never be the same. God has touched my heart deeply for this nation! James began praying for strength. Our team went around the room praying for them. At one point, we gathered around a woman who was weeping. The Holy Spirit touched her and she began praying in English, “Jesus loves me. I love my family.” Later we found out that she did not know any English and that she prayed supernaturally. 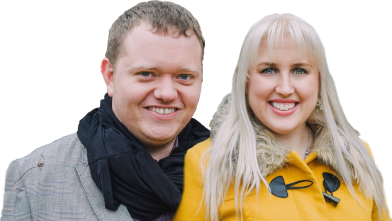 She received deep inner healing from fear and her marriage has been restored. On Sunday, December 9th, we talked with Pastor Abano, our conference organizer, about the Pastor’s Conference. He told us that many Haitians, mostly young adults, have decided to start a Night Watch from 8 pm-6 am every Friday until Jesus returns. We just received news that over 300 people showed up the first day and many stood outside the church because they could not fit inside. When scheduling my visit with my Compassion International Sponsor Child, Jeff, I made a terrible mistake double booking with our orphanage visit. So, James and I made last minute international calls to Haiti trying to fix it all. 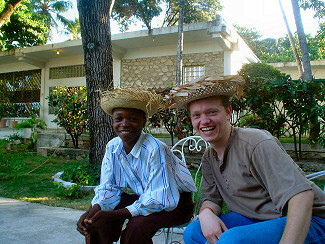 On top of that, the expenses for getting him into Port-au-Prince were very high for my missionary budget. I didn’t know if it was all going to work out. Amazingly, the day before it all came together. “Jeff, his father, and the Compassion staff arrived at the OMS Hotel Monday evening, December 10th. It was so amazing! I played piano with him singing the songs in Creole that I had sung at the conference (the only Creole I know!) After that we exchanged gifts. He brought me a nice new hat. I gave him an LED flashlight, a soccer ball, math flashcards, pens and pencils, and a notebook. Then, I told him why I sponsor him. I told him my deepest desire for him is that he would grow in the knowledge of who God is. I then told him the story about how I saw his picture when I was seventeen and that the Lord told me to sponsor him and that he would provide the money for it every month. At the end of our time we all prayed together. 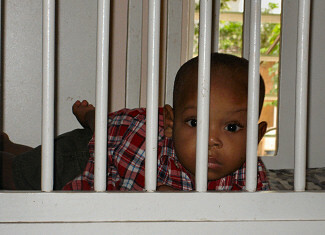 On Tuesday, December 11th we visited an orphanage in Port-au-Prince operated by a friend of James’. When we arrived at the orphanage we went to a back room. Lining the walls were about twenty cage/play-pen type things on top of each other with toddlers inside. My heart broke. I know that the orphanage is doing the best they can with such limited resources. The loving staff began opening the cages placing the toddlers down so we could hold them. 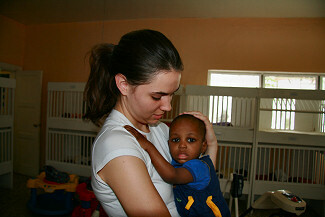 Each of the children was so desperate to be held. One little boy was still in his cage so I opened it up and held him. I put together a basic Creole phrase from my song, “Papa Bondye Kenbe Ou” (“Father God hold you”). I had to put him down so I could hold some of the others. He began to cry. I looked into his eyes saying that phrase. He looked back and stopped crying. I believe, somehow, Father God, through the Holy Spirit, filled His heart with hope. As I put this little boy back into his crib he started crying. I told him in my broken Creole, “Father God will hold you”. He stopped crying. Next, I went to see the older kids. They swarmed me saying something in Creole I couldn’t understand. Finally I understood what they were saying, “Papa, Papa, Papa”. I was overwhelmed. Then, one of the girls looked at me and said, “Papit” (Daddy). At that point, I couldn’t take it anymore. I left the room and just sat down overwhelmed with the orphans’ need for a Father. We gathered all the kids together. Joy led worship and I preached on Father God’s desire to hold each of them from John 14. I told them Jesus’ promise, “I will not leave you as orphans. I will come to you.” I told them, “whenever you need a Father, if will give your lives to Him, He will be there to hold you”. Then, I sang my song, “Papa Kenbe Mwen”. I think many orphans left with hope that they had never had knowing that there is a Father who can hold them. Day 8 was our surprise fun day! We went to a resort on the beautiful Caribbean Ocean. It was an amazing time of rest and fun for our team! 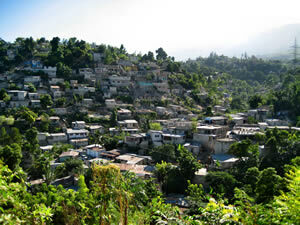 Driving through Port-au-Prince was so sad. The streets and rivers of the city were filled with trash. Earlier in the trip, our van stopped in front of people getting water from a dirty storm sewer right next to all of the trash. I have never seen such poverty! On Thursday, December 13th, we went about an hour outside of Port-au-Prince to a ministry complex called “The Rock” in Quadaboke. The walled complex sat in a valley surrounded by beautiful mountains and about 400 witch doctors in a five mile radius. The warfare for the last four days there was the most intense of the whole trip. Fourteen kids made decisions to follow Christ! During the conference, our drummer, Victor, preached a message on intimacy with Jesus that was deeply needed for the house of prayer at The Rock. Also, Joy and I led a Harp and Bowl (Rev. 5:8) Clinic modeling a prayer meeting like we do in Kansas City at IHOP. 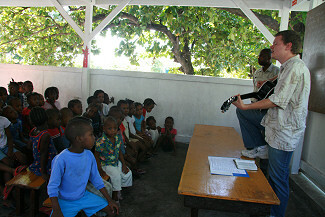 We invited up their Haitian singers. 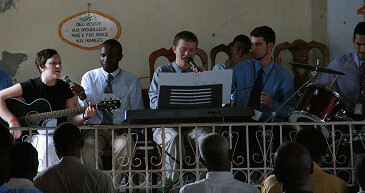 They sang in Creole with us as others Haitians prayed. It was so much fun! On the last day of the conference, we had a program for the kids at The Rock’s school. 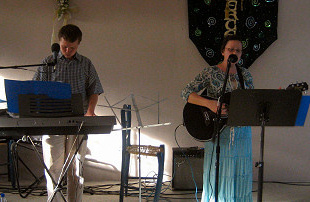 I led worship and Kristi preached. She gave a simple gospel message. Fourteen kids responded to pray for salvation! 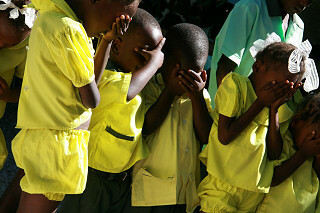 Afterwards, our team prayed for each of the kids. On Sunday, The Rock held a Christmas Program for their school. People from all over Quadaboke, including witch doctors, came to watch their kids perform. However, before they did, Gary, the director of The Rock, preached a message. At the end he gave a call, “some of you are witch doctors and you use your power to hurt people.” He called them to repent and turn to Jesus. James heard a witch doctor talking to another man. The other man looked at the witch doctor and said, “he’s talking to you, are you going to go forward?” Undoubtedly, many, like him, were impacted with the Gospel. The last day, we were able to visit once more with Pastor Abano. The Lord laid it on my heart to give my keyboard that I had brought with me to this new Night Watch that they are starting. In addition, our team gave a guitar and Victor gave hi s drum sticks and cymbals. He told us, “I have a confession to make. I told you that the keyboard at the church was ours. 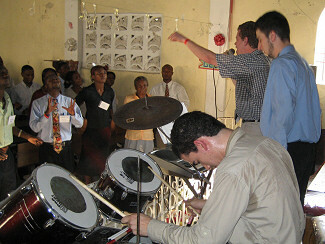 We have been borrowing it every Sunday along with the cymbals and the guitar that we had.” He said that the instruments were confirmation that they are to start the Night Watch in Port-au-Prince. 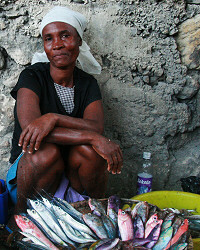 We have exciting future plans for Haiti this year. We want to do another Pastor’s Conference possibly in December. Also, there is a dream in our hearts in September to call 10,000 Haitian young adults to a conference like IHOP’s One Thing Conference. It will require over $150,000 US to pull it off. We are confident that God can do above and beyond what we can imagine. If you would like to give towards this specific need, let me know and I will put you in to contact with James Adams. 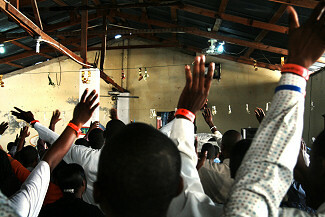 As I start 2008, I am stirred like never before that God really is raising up a Global Worship and Prayer Movement. I believe that what we are doing at IHOP in Kansas City is blazing a path for houses of prayer to be raised up in cities all over the earth. February 10th-17th I am coming to East Texas. I would love to meet with many of you that live in East Texas, show you pictures and video from Haiti, and just share my heart for this nation and the house of prayer. Would you email me with a time and day during the week of February 10th-17th that would be good for you? Thank you again for your support and prayers. I am so privileged to have team like you behind me in all that God calls me to do.